The history of Bali can be traced back to 2000 BCE, when the first inhabitants were thought to have migrated from other parts of Southeast Asia, and Oceania. Artifacts of this era were discovered in the region of Cekik, located at the western most tip of the island. The people of Bali at this time were hunter-gather tribes, with populations concentrated along rivers, and lakes. The name "Bali" is referenced in various inscriptions as Baliwipa (Bali Island) starting in the first-century CE. Bali became one of the stopping points after the Silk Road was established in 207 BCE for Chinese and Indian ships waiting for the monsoon winds to shift. The winds would blow for six months in one direction, and then would shift to the other direction for the next six months, allowing for rapid sailing between the regions of India, and China. This exposure to other cultures brought not only trade, but introduced two new religions to the region as well. Hinduism was the first new religion brought by Indian traders, and is referenced in Javanese folk-lore stories of the Mahabharata epic dated all the way back to 78 CE. In 414 CE, a Chinese Buddhist monk, named Faxian, noted in his journal that at least two major sects of Hinduism were being practiced in Indonesia. There were actually nine sects being practiced in Bali at this time, each worshiping a specific deity as its personal Godhead. Buddhism was also introduced early on, with records mentioning its existence in the 2nd-century. Since traders had been visiting Bali since around 200 BCE, it is possible that both Buddhism and Hinduism have existed to some extent in Bali for much longer. Bali has had a long history with both religions; ancient records indicate they co-existed as major religions here for at least seven hundred years. In fact, many people in Bali would practice an amalgamation of both together. 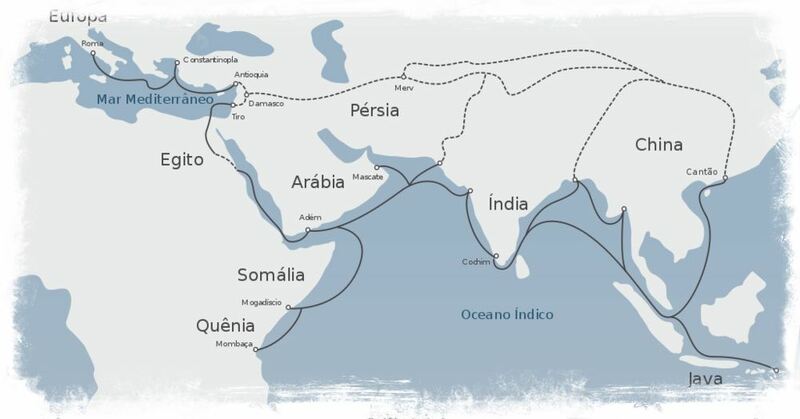 The effects of the Silk Road launched Bali into rapid expansion. From hunter-gatherer systems Bali grew into established villages, and into complex organized civilizations. Not much is known about the government structure until 914 CE, when ancient records make mention a king—Sri Kesarivarma. Bali was also noted to be an independent nation at this time, with both Hinduism and Buddhism being practiced at this time. An important figure in Balinese history is Airlangga. His mother’s name was Mahendradatta, who was a princess of the Isyana Dynasty. Her brother was the king of the Medang Kingdom (which covered central and east Java). His father’s name was Udayana Warmadewa, who was the Waramdew Dynasty king of Bali. The marriage was probably arranged to assert the Isyana Dynasty’s power in Bali. Airlangga was born in Bali, although his biological father is probably not King Udayana. Airlangga is thought to have been the product of a prior marriage that ended with Queen Mahendradatta becoming a divorced or widowed. This speculation is due to the fact that Airlangga, though the eldest child, was not selected to be Udayana’s successor. He was sent to live with his extended family in Java under the care of his uncle Dharmawangsa, the Medang king, when he was in his early teens. His time here was spent on education, and being taught leadership. He was betrothed to his cousin, one of King Dharmawangsa’s daughters, establishing Airlangga as a potential heir to the Medang Dynasty. Under his uncle’s rule, the Medang Kingdom had become very powerful, and there were aspirations to expand even further. In 990 CE a naval attack by the Isyana dynasty (Medang Kingdom) was launched against the massive Srivijaya Empire, which at its peak stretched from East Java up to where modern day Malaysia, southern Thailand, and southern Burma are. The attack was against Palembang (which is the second-largest city on the island of Sumatra today). This attack failed. As retaliation for the attack the Srivijaya killed the entire royal family, including the king, on Airlangga’s wedding day. Airlangga’s betrothed, and most of the people present were killed, ending the Isyana dynasty in one fell swoop. With the help of his personal guard, Narottama, Airlangga escaped into the forests of central Java, and lived as a hermit where he practiced severe asceticism. Several years later, in 1019 CE, he rallied support from those still loyal to the Isyana dynasty, consolidated power, and started a new kingdom in the area that had once been ruled by his uncle. His influence continued to grow as the previously powerful Srivijaya empire began to weaken. He was well-known for his religious tolerance, being raised under both Hindu, and Buddhist tradition. His influence strengthened both in central and eastern Java, as well as Bali, which he gained influence over near the end of his reign. He was a lover of the arts, and encouraged them in his kingdom. After the king of the Srivijaya empire was taken prisoner by the Indian Emperors who were raiding various parts of Indonesia at the time. His daughter took over the rule of his kingdom. After continued raids, she eventually fled to East Java, where she took refuge with Airlangga, and became his queen consort. In 1035 CE he built a Buddhist Monastery for her, called Srivijayasrama. 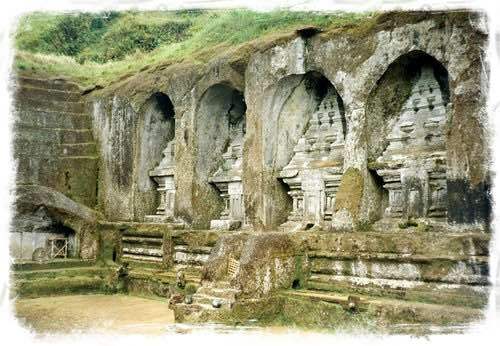 Airlangga was also very interested in agriculture, and built irrigation systems, including a dam on the Brantas river. His efforts may have contributed to the development of Subak in Bali, which is still in use today. Subak is a blend of irrigation, democracy, culture, and religion all in one. The primary goal of Subak is to irrigate crops for successful harvesting year after year, while maintaining harmony between the natural world, the spiritual world, and people. You can read more about this facinating system in an article specifically on the subject on this site. Near the end of his life Airlangga split his kingdom, due to the difficulties he had with succession. His daughter Sanggramawijaya was the crown princess (ancient Indonesians didn’t seem to have the same kind of male-centric views on leadership that western cultures had at this same time period), but she opted to become a Buddhist hermit rather than to accept her role as queen regnant. Instead, he divided the kingdom in half and passed it on to his two sons, Janggala and Kediri. He abdicated the throne in 1045 CE, and lived the rest of his days as a hermit under the name of Res Gentayu. He died four years later at the age of 46. After Airlangga’s death, Bali took back its semi-independent status, peacefully coexisting with the kingdoms that governed Java until 200 years later when the rule of the Singhasari dynasty extended its control into Bali. 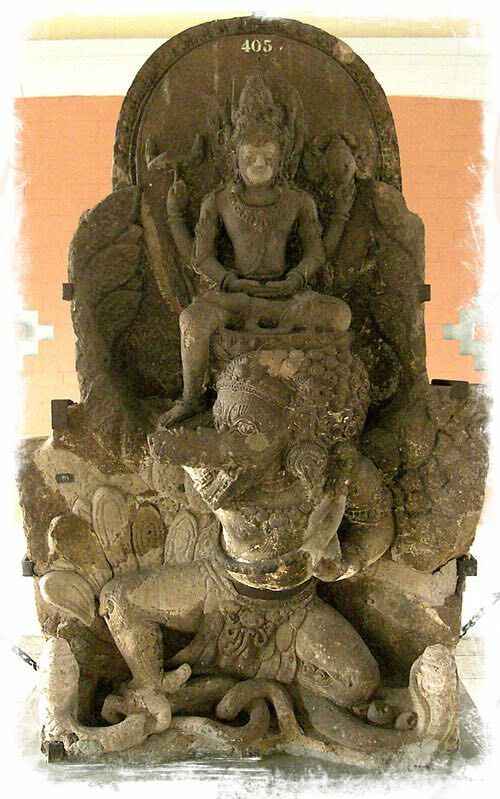 This part of Bali’s history starts after a man named Kertanagara succeeded his father to became the king of the Singhasari dynasty in 1268, and began his conquests of nearby territories almost immediately after taking power. In 1284 CE he subjugated Bali, and turned the island into a vassalage. A few years later, in 1289 CE, Genghis Khan’s grandson, Kublai Khan, sent ambassadors to Java to ask tribute from Kertanegara. Being offended by the request, Kertanegara sent the ambassadors back to Khan without ears, and disfigured faces. Immediately afterward, he tried to consolidate more power in anticipation for the military retaliation he expected from Khan. He was successful, and had taken control of the entire islands of Java, and Bali. Just before the attack from Khan, however, Jyakatwang (prince of Kediri) revolted. This further divided his troops who were spread all over. Jyakatwang launched a diversionary attack to northern East Java, which drew Kertanegara’s remaining troops away from the capitol city. With the capital defenseless, Jykatawang attacked the capital, killed Kertanegara and installed himself as the new king. One of the surviving relatives of Kertanegara (it appears that Jyakatwang did not have the non-combatants killed) was his son-in-law, Raden Wijaya, who later established a settlement on Madura Island (part of East Java) that would grow into the mighty Majapahit Empire. During the civil unrest in Java, Balinese leaders seized the opportunity to retain their autonomy under the rule of the Pejeng dynasty, which was centered near modern day Ubud. In the winter of 1292 CE, a Mongol force finally landed in East Java to retaliate against Kertanegara, who they discovered was already dead. Raden Wijaya allied himself with the Mongols to retake the Jykatwang controlled Singhasari dynasty. After they defeated Jykatwang’s forces, and deposed the usurper king, Raden Wijaya turned his attentions to getting the Mongols (who were his allies at this point) out of the region. The Mongolian forces, already strained due to the Mongol empire spreading forces too thin. The troops in Bali were further weakened by heat, and tropical diseases. 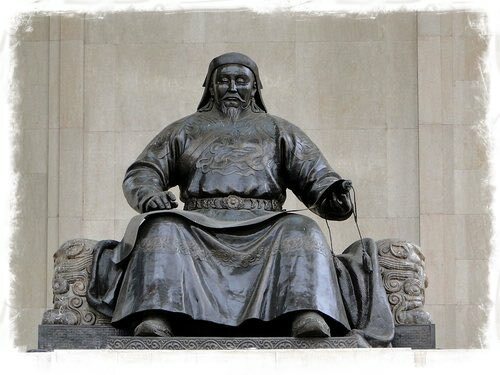 Seeing the Mongolian's weakness, King Raden Wijaya took the opportunity to drive the Mongolians from Indonesia all-together. He quickly launched a surprise attack against the Mongol army, forcing them to flee into the woods. Knowing they had no re-inforcements, and that the monsoon winds would shift soon the Mongols were forced choose between escape during the last of the monsoon winds, or to stay and fight. Continued fighting would have meant waiting at least six-months, risking complete annihilation from the fighting with King Raden. Rather than face this near certain death, they decided to flee back to Mongolia in defeat. Defeating the Mongol, and driving them from their lands made Indonesia one of very few regions of the world which successfully beat back the Mongolian Empire at this time in history. 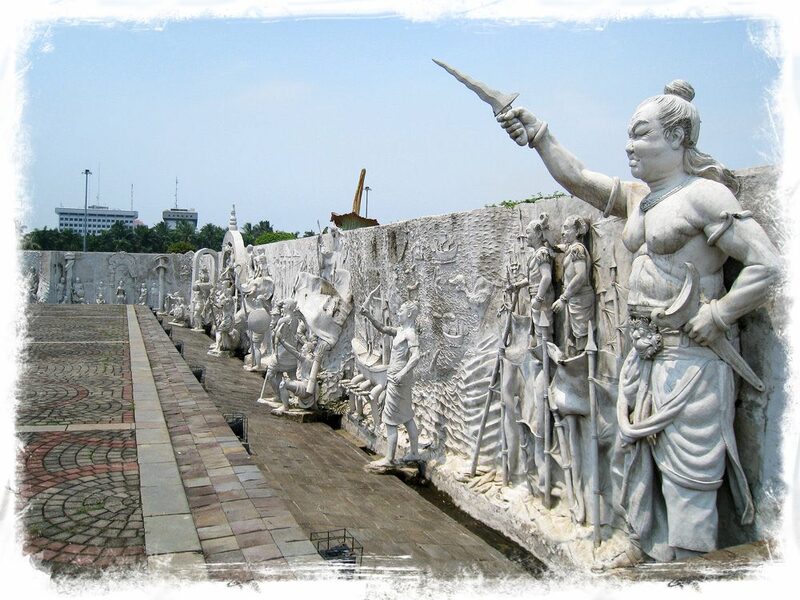 Having reclaimed the lands Singhasari dynasty (at this point Bali was still under the rule of the Pejeng dynasty), Raden Wijaya established a new dynasty, called the Majapahit, which grew into one of the greatest dynasties in ancient Indonesian history. Raden Wijaya ruled with a firm, but very capable hand. He officially ascended to the throne on November 12th, 1293 CE. He also married all four of Kertanegara’s daughters during his coronation, which he hoped would solidify his claim over the empire. Additionally, he married a Sumatran Malay Dharmasraya princess named Dara Petak, to help him further expand his kingdom's influence. Real expansion during his reign proved impossible, however, as he faced rebellion from some of his closest, and trusted advisors who were all led by the prime minister, Halaytudaha. During an attempted assassination, the commander of Raden’s guard, Gajah Mada, helped him flee the capital city. Later, with the aid of Gajah Mada, Raden returned to the city and put down the rebellion. When all the rebels had been killed, Halaytudha was executed. Raden Wijaya died shortly after this in 1309 CE. Raden was succeeded by his son, Jayanegara, who was not well liked. He was considered to be of questionable, immoral character for taking his stepsisters to be his wives. The people called him “Weak Villain,” which exemplified their contempt for this leader. A rebellion was led against Jayanegara by a man named Kuti in 1319. Kuti successfully deposed Jayanegara; however, like his father before him, Jayanegara was saved from assassination by Gajah Mada, who helped him escape the capital city. Kuti proved to be even less popular with the people than Jayanegara had. Shortly after Kuti’s reign had begun, Gajah Mada snuck back into the capital, organized a counter-insurrection, put down Kuti, and re-installed Jayanegara as the king once again. Gajah Mada was promoted to what can best be described as prime minister for his help in restoring the king. Gajah’s loyalty to Jayanegara disappeared, however, after the king decided to take Gajah’s wife, and use her as one of his own consorts. Gajah Mada bode his time waiting for the right opportunity. 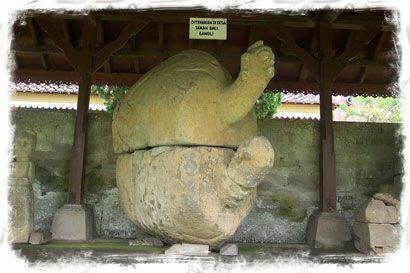 In 1328 CE he arranged for the assassination of Jayanegara, having him killed by his personal physician while the king was ill. Gajah then “sussed out” the physician, Tancha (sometimes spelled Tanca), and had him executed for assassinating the king. Because he had no sons, Jayanegara was succeeded by his stepmother’s daughter, Tribhuwana Wijayatunggadewi. In 1336 CE, after he had helped put down yet another rebellion that began in 1331 CE, Tribhuwana appointed Gajah Mada as her prime minister. This began a golden age for the Majapahit Empire. He would become a household name, and is still revered all over Indonesia today. He was a hero of the people, born of humble beginnings and rising to power by using his intelligence, his strong loyalty (one can’t fault him for being more loyal to his wife than his king), and fierce determination. During his appointment confirmation, he swore an oath that he would live simply, foregoing worldly pleasures, vacation, or receive a salary from his position, until he conquered Nusantara (Indonesia). This was such a bold commitment, that even his closest friends doubted his ability to see it through. In 1343 CE he would begin realizing this lofty goal by invading Bali, defeating the Pejeng dynasty, and bringing Bali under the control of the Majapahit. He would eventually go on to fulfill his oath, however, he was demoted due to some of the extreme methods he had taken during this quest, and lived the rest of his life in obscurity. Look forward to an upcoming blog entry for more on this fascinating figure in Indonesian history.